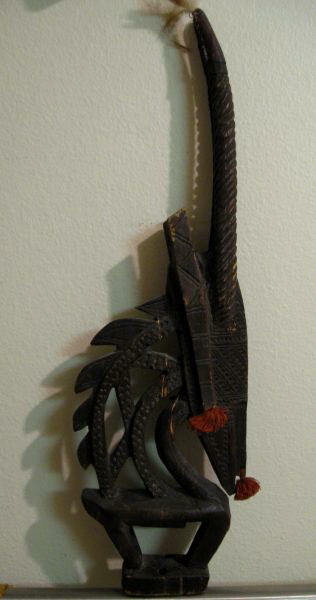 Welcome to a look at some of my African art. We’re starting with a carving that has proven to be a disappointment. 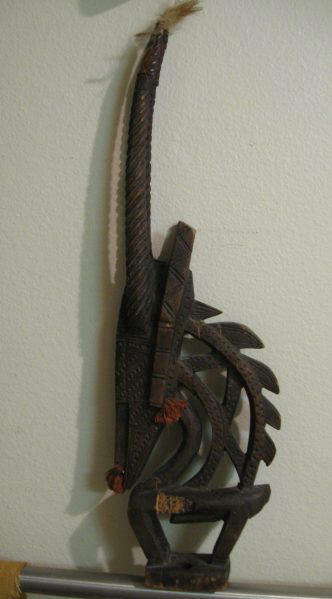 This Bamana antelope figure, made in Mali, from wood, trade cloth, animal hide and hair, was the hands-down treasure of my folk art collection. It wasn’t expensive; it’s in poor condition. The wood apparently has very little moisture content, which I think accounts for its fragility. But it spoke to me as no other object in my collection did. — Until I found out it’s just a half-size model, made to represent an authentic, ceremonial one. 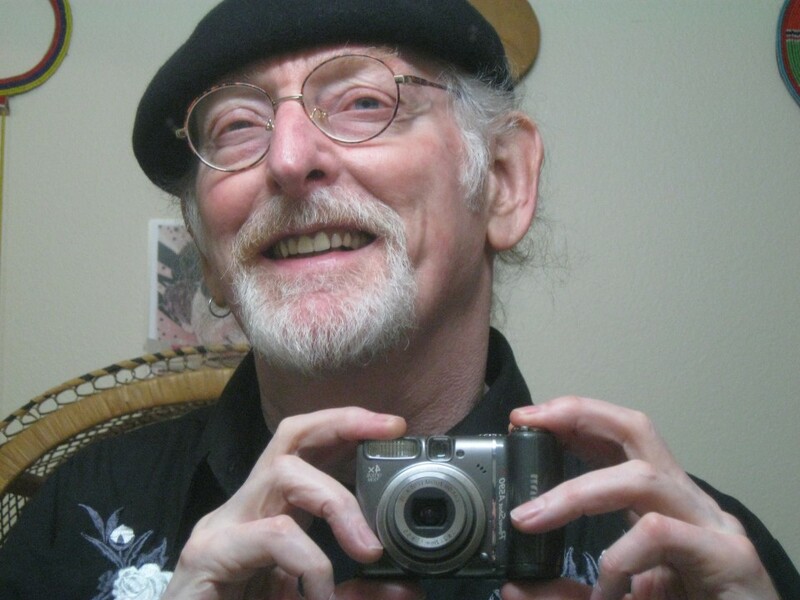 I rescued it years ago, from “Antika” in Greenwood, a neighborhood in Seattle, Washington. 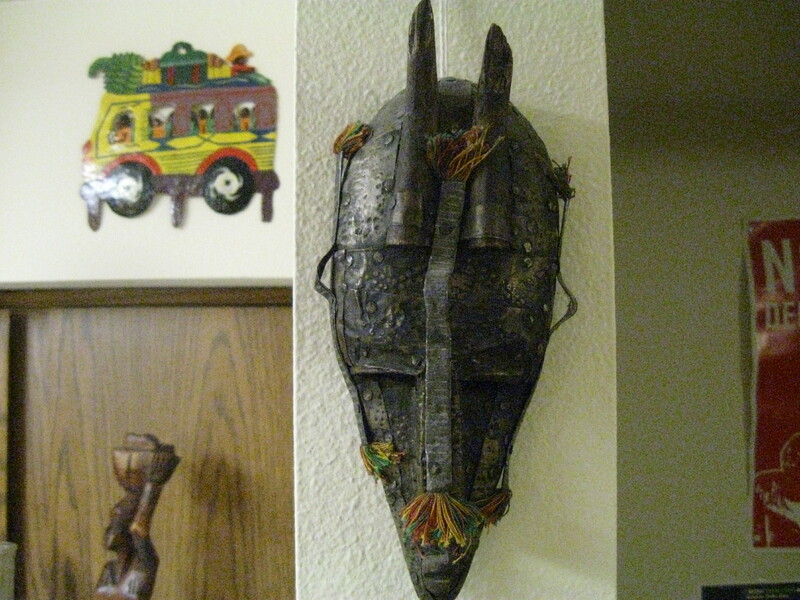 (It’s amazing how much African art winds up in antique stores.) A full-sized figure would be worn as a headdress during fertility ceremonies. The much-hoped-for result would be for the grass to grow. The antelope eat the grass; grass is necessary for all life to be sustained. — I still like this one, because I’ve had it a long time, and I think it’s a beautiful example of carving. A lot were made, which says I’m not the only one who wanted one. It’s nice to have a carving that pays tribute to tribal customs. I learned from posting about this in one of my Facebook groups that this type was made between 1940 and 1970. I’m thinking mine would be in the older range. The object is so dry it probably weighs under a pound. 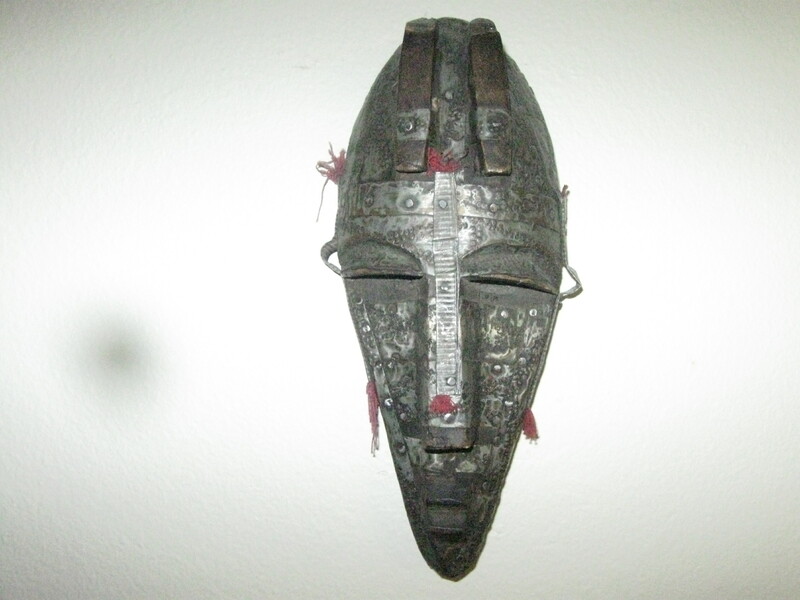 I have several Bamana masks, which incorporate hand-tooled metal. While I cherish them, I don’t know the story behind the masks; haven’t been able to unearth that (yet). The walls in my senior apartment don’t do justice to them, because whether totally traditional carvings, or something made for tourists, they’re beautiful. The bus seen in the photo’s margin is a Haitian “tap-tap” bus. I have three. They’re cut and pounded out of whatever metal the artist is able to find, and then enameled. I just love things made by the human heart, mind and hand. Many objects in my collection come from places which have suffered devastation from natural disasters or war; but the spirit of the artist will not be vanquished.